Quit Smoking is a mobile app that intends to help users quit smoking by tracking their health and savings after quitting. When users open the app for the first time, they are required to enter their quit date, the number of cigarettes smoked per day, and the cost of each pack of cigarettes. Based on this information, the app shows users the length of the time since they quit smoking, the number of cigarettes they have not smoked, the amount of money they have saved, and the time in life they have saved by not smoking. Based on the amount of time users have gone without smoking, they can also learn about potential health benefits, such as improvements in blood pressure, reduction of carbon monoxide in the blood, reduced risk of heart attack, etc. 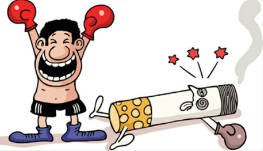 Users receive notifications and badges when they accomplish milestones such as “not smoked 5 cigarettes”, “not smoked for 2 days”, etc.